Tag Archives for " Kevin Ocasio "
Just because the world wide web has become a place where brands get a chance at massive growth doesn’t mean offline strategies no longer work. In fact, learning how to effectively market your business to regular passersby or people not hooked to their mobile devices helps you maximize your efforts. There are still customers who are not well-versed when it comes to using the internet. With that, you’ll be able to attract more customers and achieve a higher ROI. If you’re here today because you’re seriously looking to boosting your reach, we’ll show you 10 best offline marketing techniques you can incorporate into your current campaign. Explore them below. Why not write and submit a magazine article and mention your website as an additional resource? A magazine article caters to avid readers who aren’t used to blog posts. Magazines also give you a competitive edge since they’re visually engaging and target a specific population. Make sure to provide actionable insights that meet your target readers’ needs. Hook them right from a start using a compelling story they can easily relate to. It’s easy to forget a website you randomly visited for the first time. Whether or not people came across your website, business cards give prospects a reason to engage with your brand multiple times. Printed information on a business card is permanent. Individuals can quickly enter your domain name or contact information into their mobile devices when they need your services. Create a great first impression by choosing a business card design that reflects your business. If you’ve been following guerrilla marketing techniques, you’d understand what I mean by creative stickers. These stickers showcase your brand in a funny yet clever way. They also incorporate the element of storytelling. 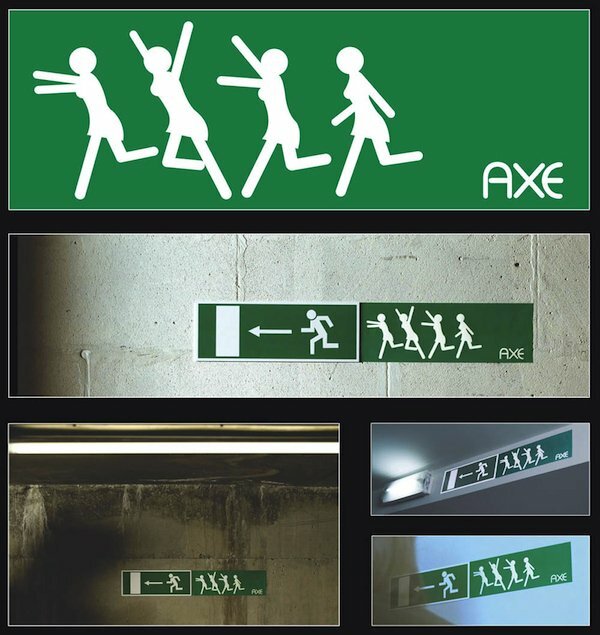 As the picture shows, Axe placed their sticker near the exit man sign. This shows Axe’s unique brand proposition of male Axe users being attractive to women. If you want to promote your social media profiles but haven’t started building your business site yet, consider advertising on radio. Remember to choose a station that targets your demographic. When you craft your radio copy, Business Town suggests that you make it catchy and straight to the point. Mention how you can serve your audience through your product or service. Depending on your goal, clearly outline the next steps or your call-to-action – which is, of course, an invitation to follow you on social media. Among the things that learners value are educational workshops. Whether you’re in the arts and crafts niche or serve B2B clients, teach your audience something new. It should be a skill or knowledge that they can apply in their day-to-day lives. Give lots of free and exclusive advice. Make your workshop interactive and engaging that your prospects will want to get more one-on-one support from you. Create a special offer that’s only accessible for participants in your workshop. More and more business owners are realizing the benefits of a sponsorship. When you sponsor an event, you are raising brand awareness and building your authority. Attendees or participants, especially media men, will spread the word about your brand. Also, even sponsorships help build new partnerships between brands. 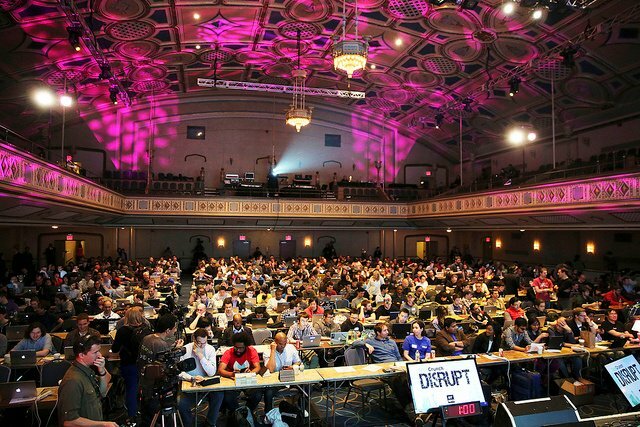 The picture below shows TechCrunch Disrupt event which was sponsored by New Relic. New Relic incorporated a Hackathon activity where people were asked to build an app in a short amount of time. They gave the winners prizes which included a MacBook Pro. T-shirts, pens, sticky notes, and lanyards with your logo on them are a form of branded merchandise. Creating and giving away these items helps spread your name like wildfire. These promotional materials speed up your marketing. Also, you’re able to garner loyal customers in the process. Don’t forget to print your social media and website on your branded merchandise. To add some excitement, you can print promotional codes that unlock discounts. Because of today’s faceless interaction, customers greatly appreciate brands that can offer a “personal touch.” Cold calls allow you to do that. Forget all your doubts and apprehensions about cold calling, because you might just gather a couple of potential customers who are ready to convert any time. To ensure that this endeavor becomes successful, carefully plan out your objective, message, and timing. It takes a little practice and confidence to get it done right. Are your online ads not getting any real results? If so, consider billboard advertising your holy grail. Imagine your audiences seeing your billboard ads every day on their way to work. Even though they’re quite expensive, repetitive exposure to these ads effectively position you on top of your customers’ minds. Some online brands use mobile billboards in order to get to their target geographical locations and local events when they need to. Get together with other brands in the same industry at trade shows. Brands that come together to display their offerings naturally attract new sales leads. Attract potential customers to your booth by using banner stands and giveaways. Trade shows can be quite costly so make sure you thoroughly plan out your marketing strategy. It would help to think about how you will collect people’s email addresses and your main purpose of attending a trade show. As an online business owner, you can find a ton of opportunities in offline marketing to maximize your internet growth. After all, nothing can replace personal interaction and the experience of physically interacting with a product. Bring out the best results in every offline marketing by being clear about your goals. Remember your value proposition. This will help you craft a message that’ll capture their attention and compel them to do business with you. Kevin Ocasio is a digital entrepreneur who runs the blog KevinOcasio.com. A retired Marine, he devotes his time helping newbie bloggers and business owners succeed online.